Explanation: Inner planets Venus and Mercury can never wander far from the Sun in Earth's sky. This week you've probably seen them both gathered near the western horizon just after sunset, a close conjunction of bright celestial beacons in the fading twilight. 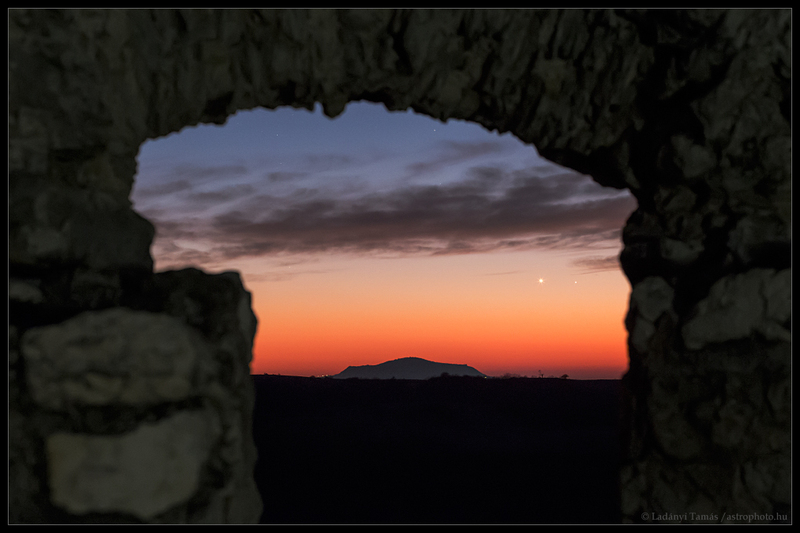 The pair are framed in this early evening skyview captured on January 13 from the ruins of Szarvasko Castle in northwestern Hungary. Above the silhouette of the landscape's prominent volcanic hill Venus is much the brighter, separated from Mercury by little more than the width of two Full Moons. On Friday, planet Earth's early morning risers will also be treated to a close conjunction, when Saturn meets an old crescent Moon near the southeastern horizon at dawn.